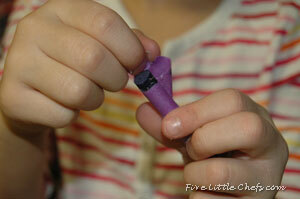 What do you do with all your broken crayon pieces? 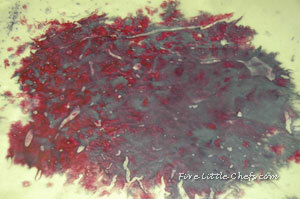 We make crayon melting art. 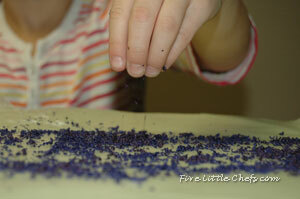 It is an easy craft that is fun to do for a family night or when friends come to play. It seems every time my Little Chefs get out the box of crayons they are not fully picked up and either I step on one and break it in two, or Little Chef H thinks it is fun to break the crayons in two. She thinks she is so strong to be able to do this! I have a hard time throwing them out because I know there HAS to be something I can do with those pieces. Well, we did find one way. 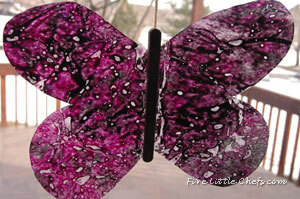 This craft does require some adult assistance because the use of an iron is required. Choose your favorite crayon and take the wrapping off of it. 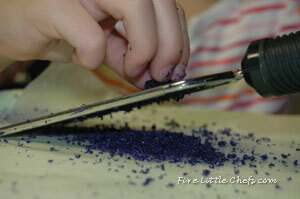 Using a grater, carefully grate the crayon onto a piece of wax paper. 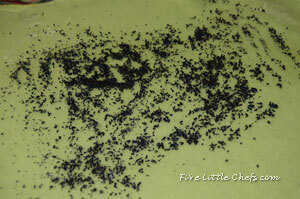 We ended up with about 2 Tablespoons of grated crayon pieces. 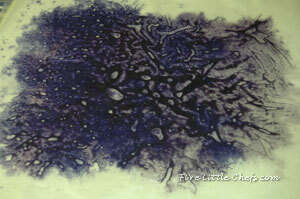 Spread out your pieces onto your wax paper. 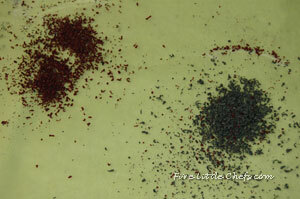 Place a second piece of wax paper on top of your first so the grated pieces are now sandwiched in between. Place a pressing towel on top of your waxed paper. Using a hot iron carefully iron your “sandwich” until the crayon is melted. This will only take a few seconds. Remember the pieces are small and will melt very quickly. Remove the pressing towel to see your creation. Let it cool for a minute. Using scissors cut out a butterfly, or a shape of your own choosing. 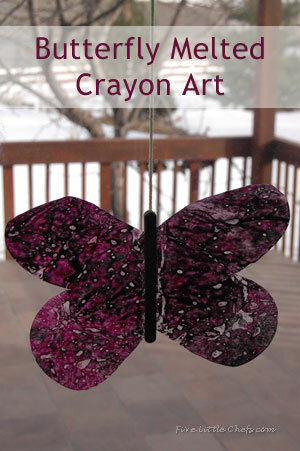 Glue one popsicle stick to one side of the butterfly in the middle for the body. 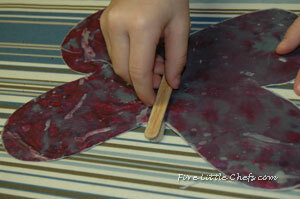 Flip the butterfly over and glue the second popsicle stick so the wax paper is sandwiched inbetween. Display it by a light source to see the maximum effect of the colors. Variation: It is also fun to use two or more colors of crayons. Grate your colors then mix them together before ironing. Spicy Fry Sauce. Great to dip or sauce your bun! 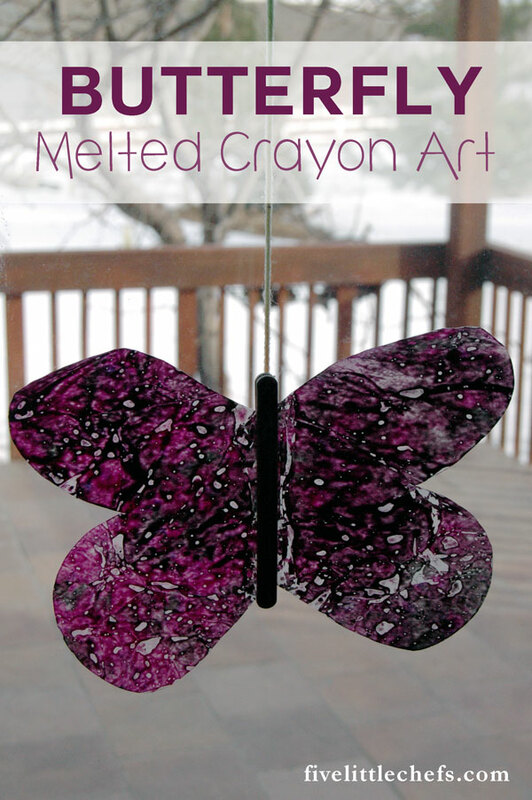 13 Replies to "Butterfly Melted Crayon Art"
I remember doing this with my mom when I was a kid. Really fun! Thanks for reminding me about it & sharing your pictures. Btw I grabbed your card at the BYBC on Sat and just wanted to come by and say Hi! This is the perfect craft for my little nieces coming to visit for spring break. Oh what fun! I pinned it. I hope that you will share this at my party: http://www.tumbleweedcontessa.com/blog/whatd-you-do-this-weekend-3/ Glad to have seen it on Wow Me Wednesdays. Thanks so much! Thanks for the invite I’ll go check it out and link up! It came out really nice and I bet this is a craft the kiddos really like! It’s a fun way to make use of items that are around all of the time. You are exactly right. I love doing crafts with household items. 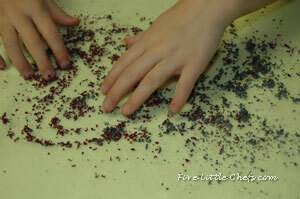 It is more difficult to run to the store and get one unusual thing to do a craft with all my Little Chefs. We usually loose steam after we get home and put it off! A great project, looks like a lot of fun! Hope you have a fabulous week and thank you so much for sharing with Full Plate Thursday.